The process of reading the genetic code of DNA to produce proteins involves an intermediate molecule called messenger RNA (mRNA). Initially mRNA contains sequences that won’t form part of the new protein, termed introns, as well as protein-coding sequences known as exons. Removal of introns and joining together of exons is called splicing and is performed by the spliceosome, a large molecular machine in eukaryotes that plays an essential role in the control of gene expression. The junctions between exons and introns, known as splice sites, must be very precisely recognised, since mistakes in producing mature mRNA can lead to disease. A new study from Kiyoshi Nagai’s group in the LMB’s Structural Studies Division has identified the previously unknown mechanism by which the splice site at the start of an intron is brought to the active site of the human spliceosome, allowing the reaction to begin. The nucleotides at the start of introns base-pair with RNA nucleotides within the U1 component of the spliceosome, just as two DNA strands base-pair with each other. A helicase protein called Prp28 then mediates transfer of the splice site from U1 to another RNA component of the spliceosome, U6 which is to form the active site of the spliceosome. 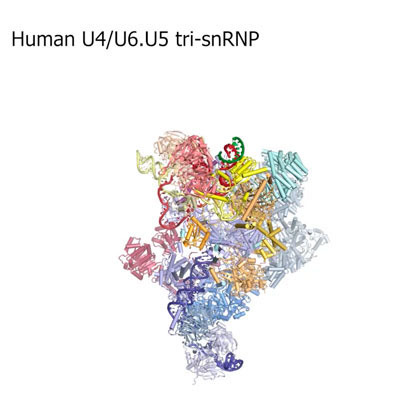 U1 was the first complete spliceosome component to be visualised structurally, by the Nagai group in the 2000s, but despite the structural biology revolution brought on by advances in electron cryo-microscopy (cryo-EM), no structures had yet shown the very transient interaction between U1 and the rest of the splicing machinery. Thus the precise mechanism by which the splice site is delivered to the active site of the spliceosome was still not known. 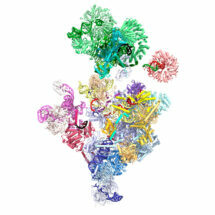 Helicase proteins separate paired DNA or RNA strands. By using a mutant form of Prp28 that is unable to separate U1 from its paired splice site, two researchers from Kiyoshi’s group, Clément Charenton and Max Wilkinson, were able to use cryo-EM to determine the structure of a spliceosome frozen at a point immediately before transfer of the splice site from U1 to U6. Using this structure, they could see exactly how Prp28 clamps around U1 to free the splice site and the way in which U6 is positioned and “primed” to receive the splice site immediately after its release. Their structure also suggests how binding of the splice site to U6 might trigger a series of rearrangements leading to active site formation. This movie presents how the 5’ splice site is delivered to the spliceosome by the U1 snRNP, transferred to the U6 snRNA through the action of Prp28, and how this transfer triggers an important remodelling in the spliceosome, which ultimately leads to the formation of its active site. 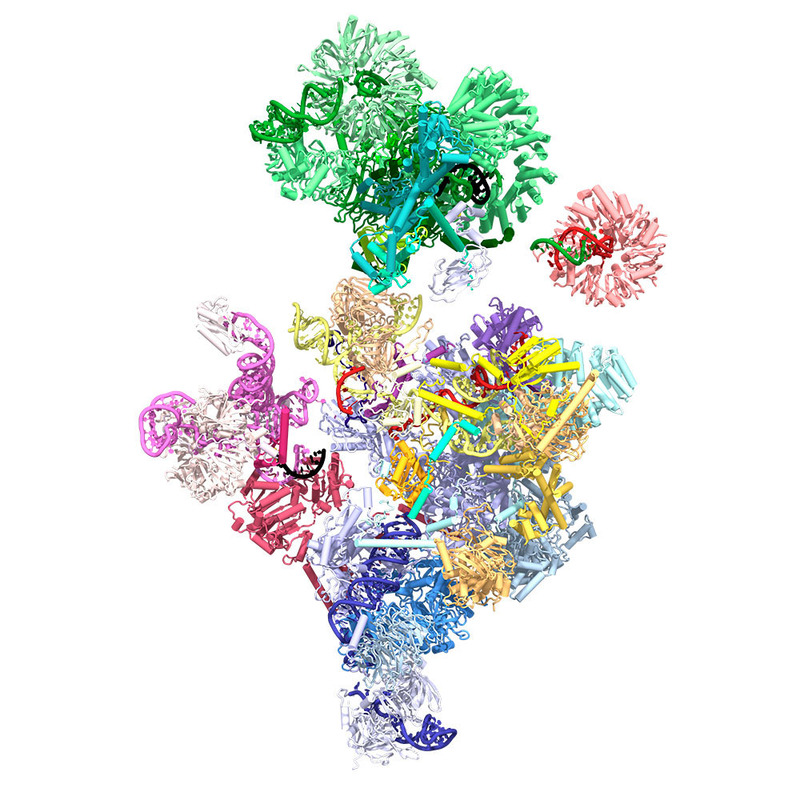 The spliceosome is a complicated and formidable example of a multi-subunit molecular machine, with the pre-catalytic form being the largest spliceosomal complex, containing 5 RNA molecules and 65 proteins, in addition to a substrate mRNA precursor. The arrangement and activities of all of these has to be intricately coordinated, paradoxically to catalyse a rather simple chemical reaction. It is estimated that 15-30% of hereditary diseases are due to errors in this process. By providing a high-resolution structure of the human spliceosome, this study could provide a starting point for drug design. The work was funded by the MRC, ERC, EMBO, Marie Sklodowska-Curie Actions, and a Cambridge-Rutherford Memorial PhD Scholarship.